The Web is full of short URLs such as bit.ly/cwd2hp. The products of URL-shortening services--bit.ly, Tiny URL, and others--these cryptic URLs appear on social networking sites such as Twitter--and increasingly in other places on the Web as well. Those shortened links are useful for people posting them, but they pose a problem for the people who might want to follow them. Before you click, you have no idea where they lead. Expand Short URL shows the original long links on short URLs created by URL-shortening services. The free Firefox add-in Expand Short URL does an excellent job of solving the problem. Right-click any short URL and select Expand Link, and a box pops up, showing you the original, long link. You can copy it to the clipboard, or immediately head to the location where the URL links. The add-in works with the major URL shortening services, and does so without a hitch. 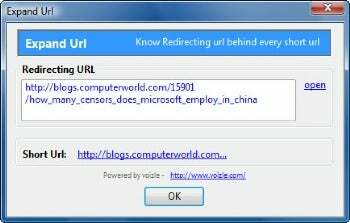 Expand Short URL works on all Web pages, including Web mail services and social networking sites. Expand Short URL does the same task as another Firefox add-in, Long URL Please. There is only a minor difference between the two. Long URL Please doesn't require you to right-click a link; you see the original long link right on the Web page. Which should you use? If you want to see the actual short links on a page, and only want to see the long links in certain instances, Expand Short URL is a better bet. If you want to see all shortened links automatically lengthened, Long URL Please is a better bet.